His Royal Highness, The Prince of Wales, has celebrated the academic excellence of a very special group of students from the University of Southampton during a visit to Mexico City. 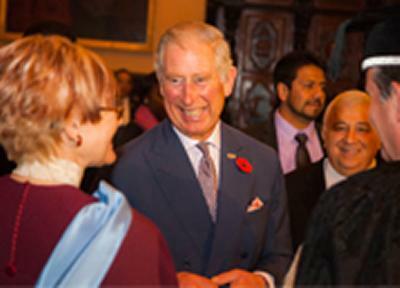 Prince Charles, visiting Mexico to launch the ‘Mexico in UK/UK in Mexico year 2015’, attended an exclusive Ceremony of Recognition of Education Excellence at the Colegio de San Ildefonso honoring six graduates from the University’s online Master of Arts (MA) in English Language Teaching. The University was specifically requested to take part in this private royal event that underlined the reputation and success of the course which was jointly developed and delivered through a collaboration between the University of Southampton and the British Council. Joining His Royal Highness in honouring the graduates was Professor Alex Neill, Southampton’s Pro-Vice-Chancellor (Education); Professor Clare Mar-Molinero, Director of Centre for Mexico-Southampton Collaboration at the University of Southampton; Emilio Chuayffet Chemor, Secretary of Public Education in Mexico; Dr Eduardo Bárzana Garcia, Secretario General of the National Autonomous University of Mexico (UNAM); and Lena Milosevic, Country Director in Mexico, British Council. The students presented by His Royal Highness are all now working towards a Distance PhD in English Language Teaching delivered by the University of Southampton, with full scholarships from Mexico’s Ministry of Education. Teachers in Mexican state universities have been able to study on the MA since 2008, supported with scholarships by the country’s Ministry of Education. Nearly 60 graduates have completed the programme in that time, from over 35 different Mexican universities. The online MA is now offered across the world to individuals, ministries of education and education institutions for their teachers, with the first global cohort of students commencing the two and a half year course in February 2014. The Masters will contribute to the professionalisation of English Language Teaching globally, as well as give career and development opportunities to teachers the world over. Now teachers around the world are benefitting from the same innovative online approach experienced by the Mexican teachers to distance learning delivered by the British Council and University of Southampton partnership. Combining the University of Southampton’s reputation as a leading UK institution for Applied Linguistics with the British Council’s expertise in English language teaching and promoting quality UK higher education on a global scale, the online Master’s degree extends the partnership’s global reach in the English Language Teaching sector. “We’re extremely privileged to be joined by His Royal Highness to celebrate the achievements of our MA English Language Teaching graduates and recognise the fruitful education collaboration that has been consolidated between Mexico and the UK with this three way partnership of the University of Southampton, the British Council in Mexico, and the Mexican Ministry of Education,” said Professor Mar-Molinero. On November 17, the University will start to deliver the first MOOC (Massive Online Open Course) in Understanding Language: Learning and Teaching. This free and online course, developed once again jointly by the University of Southampton and the British Council, available in conjunction with Future Learn, will investigate the case of English – the most widely learnt and taught language in the world. The MOOC will provide a taster for some of the ideas covered in the online MA in English Language Teaching. A small number of scholarships will be available for those who complete the MOOC and wish to continue onto the full, online MA programme.